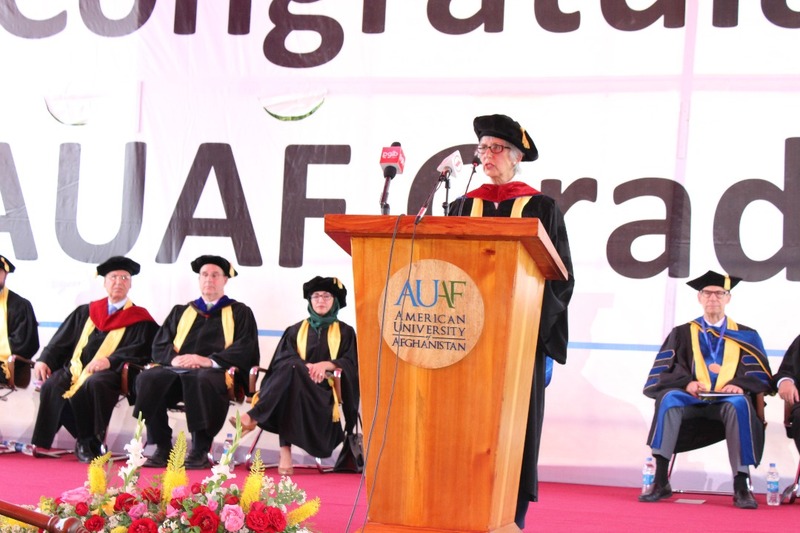 Ambassador Nurjehan Mawani, who serves as the Aga Khan Development Network Diplomatic Representative in Afghanistan was honored by the American University of Afghanistan on May 11, 2018 with an Honorary Doctor of Humane Letters as a Transformational Leader. In recognizing Ambassador Mawani, the University also recognized the tremendous work and investment of the AKDN in Afghanistan to improve the lives of the Afghan population. 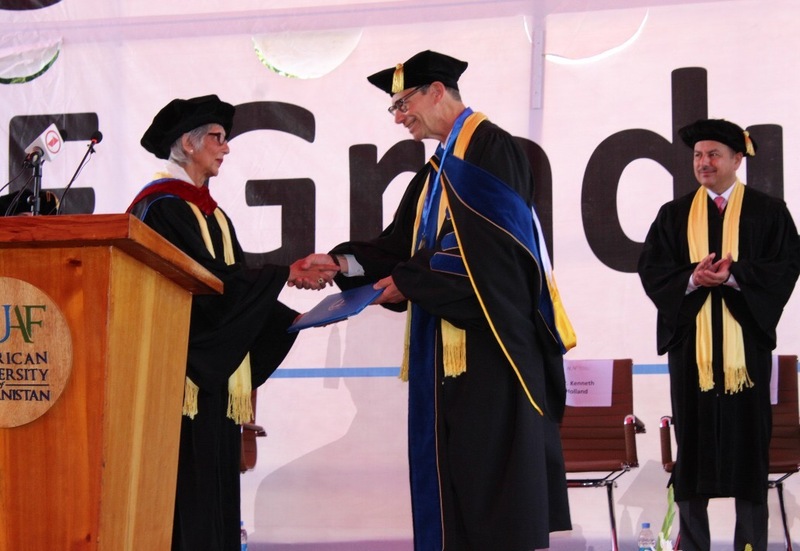 On May 11th, 2018 the American University of Afghanistan held its eighth annual commencement ceremony attended by the AUAF community, Board of Trustees, government representatives and families of students. One hundred and thirty nine students graduated from the American University with Bachelor degrees in Law, Business, Political Science and Information Technology as emerging leaders. During the graduation ceremony a special tribute was paid to Ambassador Mrs. Nurjehan Mawani, C.M., the Aga Khan Development Network Diplomatic Representative. “Governments alone cannot make democracy work. Private initiative is also essential, including a vital role for those institutions which are collectively described as “civil society,” and citizens too must play their part. Modern societies require greater focus on education to build democratic competence for leaders and the electorate and universities play a vital role in this,” said Ambassador Mrs. Nurjehan Mawani during her speech at the commencement ceremony. David Sedney, First Vice Chair of the AUAF Board of Trustees, congratulated the graduates on behalf of the Board. Dr. Kenneth Holland, the president of American University of Afghanistan thanked the international and national donor community as well as Afghanistan’s private sector for their contributions to the American University of Afghanistan and support in shaping the future leaders. The American University of Afghanistan was founded in 2006 and has graduated more than one thousand students with both masters and undergraduate degrees. AUAF provides an international standard of education of the highest quality through comitted international and national faculty, progressive teaching methods and material and a thriving student-centred environment. The university has trained some of the foremost leaders of Afghanistan and is committed to contributing to a prosperous future in the country through educating tomorrow’s leaders. AKDN agencies and institutions with the objective of improving the quality of life of the people of Afghanistan. She brings to her role in Afghanistan the experience gained from Central Asia, where she served as the AKDN Representative to the Kyrgyz Republic with responsibility for AKDN engagement in Kazakhstan. 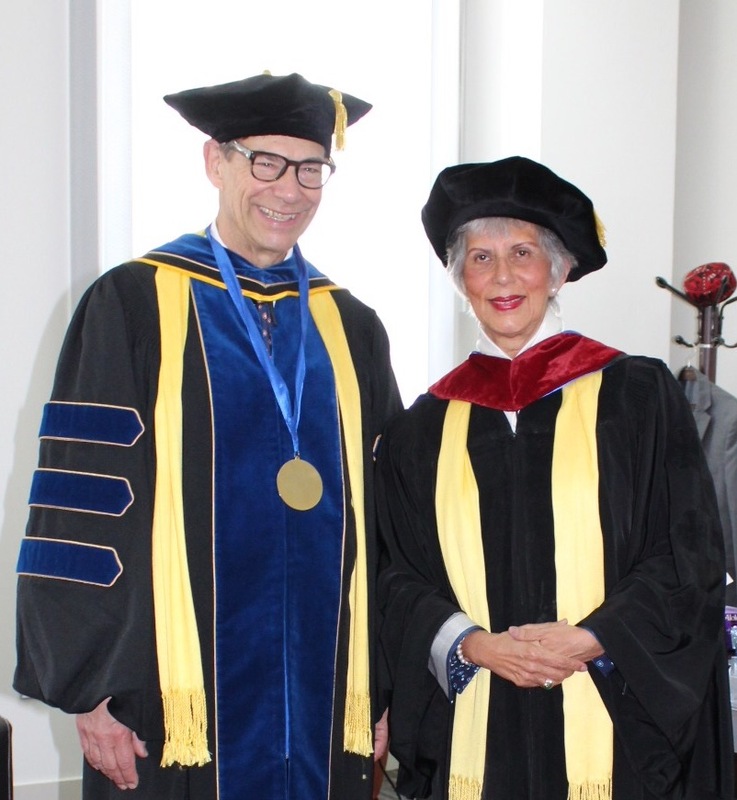 The AUAF Board of Trustees voted unanimously to honor Ambassador Nurjehan Mawani as the 2018 honorary degree recipient. This degree recognizes and honors her work as a transformational leader who emphasizes, reinforces, and enhance the humanistic qualities and diversity of others. Ambassador Nurjehan Mawani exemplifies the highest ideals held by those who seek to educate those who will change the world through innovation, creativity and societal leadership. It also celebrate her deep commitment to Afghanistan. 2018 Commencement Ceremony. Her acceptance of this award will inspire our graduates through her continuing role as mentor through all of her contributions and outstanding achievements. She has been a driving force in the health sector, business, law, philanthropy, education, showcasing cultural heritages, and as an advocate of the performing and visual arts. I am deeply touched by your warm welcome and generous remarks. Today, I accept this honour with the utmost gratitude and humility, conscious of the great distinction and achievements of past recipients. It is a privilege to be associated with a University that strongly supports academic excellence, meritocracy and diversity. I am so pleased to be standing here surrounded by young Afghan graduates who hail from every province in the country and so many young women as well! The graduates here today are from numerous disciplines including: Business, Information Technology and Computer Science, Law, Political Science and Public Administration, preparing you to meet the needs of Afghanistan. Right here in front of us, we see the hope and bright future of Afghanistan. It is an Afghanistan that embraces equality, an Afghanistan that values human progress and an Afghanistan that cherishes a pluralistic outlook. Afghanistan is in its ‘Transformation Decade,’ and with that comes a preoccupation with government’s role on reform, good governance and self-reliance. However, we must not overlook the important role of civil institutions in this transformation with the Government creating an ‘enabling’ environment for a thriving civil sector that is essential in renewing the promise of democracy. Governments alone cannot make democracy work. Private initiative is also essential, including a vital role for those institutions which are collectively described as “civil society.” Citizens too must play their part. Modern societies require greater focus on education to build democratic competence for leaders and the electorate and universities play a vital role in this. In addition to shaping tomorrow’s leaders, universities also have the power to transform perceptions within a society. Often, it is perceptions that will shape one’s sense of reality, clouding judgement. In its short history, the American University of Afghanistan (AUAF’s) has demonstrated its commitment to enlighten. This university has created safe spaces for dialogue where one does not demonize another’s point of view. Its faculty and graduates are committed to achieving academic excellence, understanding, meritocracy and the delivery of the highest standard of education that this country needs. Therefore receiving this honour is very meaningful. Within the Aga Khan Development Network (AKDN), the Aga Khan University and the University of Central Asia (UCA) embody the same ideals of institutional and individual excellence, a cosmopolitan ethic, and prepare their graduates as future leaders to serve the needs of their countries and regions. In this region, UCA’s mission is to specifically address the economic and social challenges of mountain societies through the power of education and human ingenuity. This institution was established by international treaty between the Governments of Kazakhstan, Tajikistan, Kyrgyzstan, and His Highness the Aga Khan. Integral to this were partnerships to intellectually bridge the imposing mountain terrain, including in Afghanistan, such as that between UCA and Badakhshan University. Indeed, the power of partnerships is further exemplified upon the discovery that the UCA campus site in Naryn, Kyrgyzstan is partially situated on a rich archaeological site. With no archaeologist of their own, UCA brought on an American University of Central Asia (AUCA) Associate Professor and Archaeologist, Dr. Aida Abdykanova, to lead the successful excavation and preservation efforts. And we look forward to furthering collaborations between our institutions. An important goal of quality education is to prepare each generation to participate effectively in what has been called, ‘the great conversation of our times.’ This means on the one hand, being unafraid of controversy. But it also means being sensitive to the values and outlooks of others. Remember that the spark that bestows individuality also bonds individuals in a common humanity. Acknowledging the increased importance given to respect for diversity, as individuals it will be our responsibility to foster this spirit of connection. You as the new leaders of Afghanistan, have a responsibility to engage with one another and to build a better future together. This will require a steadfast commitment to the ethic of inclusiveness and a sincere interest in capacity-building. It is a deep understanding that to truly ‘excel,’ at something as an individual will require optimal participation of the whole and the humility that allows everyone to perform at their best. This is often referred to as the ‘multiplier effect,’ or the ability of one flame to light another. In our increasingly globalized world, you will find that many of your strongest values – respect, partnership, justice, harmony – are rooted in Afghanistan’s rich history and your country’s cultural heritage. The Aga Khan Trust for Culture, (AKTC) the cultural agency of the Aga Khan Development Network, focuses on historic and cultural restoration, preservation and urban regeneration projects. AKTC has demonstrated here, as it has in other parts of the world, that culture can be a catalyst for development. The safeguarding of historic landmarks such as Bagh-e Babur gardens in Kabul, serve as spaces for recreation, contemplation, education and inspiration and opportunities for cultural connection and dialogue. Our identities may define who we are, but our history help us to understand where we come from. Afghanistan at the crossroads of civilization on the silk route, provided enlightened interaction amongst peoples that transcended faith, ethnicity and languages, providing a gateway for illuminated ideas, art and culture. This is why I was so pleased to learn about the American University’s new initiative – the Afghan Cultural Heritage Preservation Project. In alignment with AKTC’s work, the AUAF recognises and embraces how conservation and revitalization of cultural heritage can provide a springboard for social development. How such projects can have a positive impact well beyond conservation; promoting good governance, the growth of civil society, a rise in incomes and economic opportunities, greater respect for human rights and better stewardship of the environment. In addition to historic sites, Afghanistan has an astonishing intangible culture. AUAF’s Cultural Heritage Preservation Project will greatly contribute to the much-needed transmission of the country’s inherited traditions including oral traditions, crafts, rituals and practices and living expressions. Intangible culture is much more than a ‘cultural good,’ it is an underlying factor of sustaining cultural diversity against the backdrop of globalization. Little did I know, growing up in Mombasa, Kenya how globalization would impact my life and that one day I would be standing here in front of you delivering the commencement address! At the time, Afghanistan was a distant country that existed only on the map in my geography, conjuring images of Alexander the Great, fallen empires and ancient ruins. It was in colonial Africa at the time, that I witnessed firsthand the damage that a divisive society can cause. The political, social and economic environment was exclusionary and presented huge inequities. An institution that played a formative role in my life was my Aga Khan School from kindergarten to Grade 12. Although operating in a segregated context, the school embraced a ‘cosmopolitan ethic,’ where difference was seen as an opportunity and not a threat. As I became increasingly politically aware in my teens of the differences of treatment based on racial, economic and social parameters, this deeply impacted me to pursue a career focused on restoring human dignity and empowering those less fortunate. I chose law and completed my legal training in the UK. Post-studies, it was through mobilizing that training and volunteer energies that I, together with colleagues, began a community-based legal advice centre, assisting refugees and immigrants to regularize their status and to reunite with their families. My first encounter with people from Afghanistan came soon after my appointment as Chair of the Immigration and Refugee Board of Canada in 1992. It was a time of opportunity in my career to make a difference but also one of trepidation as my colleagues and I grappled with the notion that the fate of countless refugee claimants, many of whom were from Afghanistan, was in our hands. The situation called for innovative ways to fast-track these cases within the law. Sometimes we have to step outside of our comfort zone, be imaginative and take risks to find appropriate responses. Another area where it was necessary to lead change pertained to the recognition of gender-related persecution within the Geneva Convention. The authority vested in me by the law as the Chair, enabled me to issue the first set of international guidelines on Women Refugee Claimants Fearing Gender-Related Persecution which took into account the unique ways in which women experience violence and conflict. This groundbreaking work in Canada relied on evidence-based study and analysis, supported by international legal frameworks to bridge gaps between law and policy, working across multiple levels and sectors simultaneously. However, not everyone was convinced. There was resistance based on fear and at the same time support based on an understanding of the need to protect the most vulnerable and at-risk claimants. What I learnt from this experience was how to mobilize this support to outweigh the resistance. This tested everything that I had learned from kindergarten. To confront the challenges that you will face, you will need to use your knowledge, your critical-thinking skills, draw on values of patience and persuasion and moral courage for you will need all of these attributes and more to guide you to stay the course. A graduation is a time of celebration but it is also a time of reflection. What is it that will set you apart as an individual in a highly competitive, globalized world? Authenticity: Your actions have to be guided by your values. It is not only your academic achievements but your moral imperatives that will define you. 2) Knowledge: Seek new knowledge at every opportunity and use your critical-thinking along with your ethical sensibilities to embrace that knowledge and share it with others. 3) Equip Yourself: You may find yourself more often than not confronted by situations of resistance and adversary when attempting to stay the course. Equip yourself and work on building and sustaining a supportive community of individuals around you that will mentor, empower and enable you to perform as your best-self. This is a world where the ideals we grew up with, aspirations for a kinder, gentler, fairer and more compassionate world are needed now more than ever. Retain those ideals and stand firm to them. No matter what you do from here on – your families, communities, colleagues and country will look to you for expertise, knowledge and compassion. I would like to leave you with this sentiment: “human progress is inextricably linked to human cooperation,” (1) and as the proverb says: when you move alone, you move fast; when you move together you move forward. Thank you very much for allowing me to participate in and sharing this very special day with all of you.